Españolé International House is a Spanish language school located in Valencia, Spain. We offer high-quality Spanish courses in a friendly atmosphere. Españolé Ih Valencia is set in two buildings right in the city centre, surrounded by shops, historical sites and the energetic Spanish city life. Our new 650-square-metre chalet has 12 classrooms with interactive whiteboards, a workshop classroom with cooking facilities for our "Spanish cooking activities", a big students area with computers, WIFI, vending machines, reading area with books and magazines, a terrace and a welcoming patio with a pond. Our four story traditional building has 10 classrooms with interactive whiteboards, library, student's area with computers, WIFI, vending machines and a roof terrace to relax under the sun. We are part of International House and an accredited centre by the Instituto Cervantes. We are a medium size school and work to assure that our students receive personalized attention. We offer different types of intensive Spanish courses for individuals and for groups, as well as special courses, all of them given by a professional team of teachers. We have a good mixture of nationalities and ages. We are concerned with all the aspects of the stay. We take care of all the details with respect to student lodgings, and encourage our students to participate in the cultural activities we organise every week. Valencia is located on the Mediterranean Coast of Spain, it is a modern city brimming with culture, history, and many leisure activities. We have a fabulous climate, great beaches and an open, friendly attitude! This course is designed for students who wish to learn the language and have free time to participate in Spanish culture and life, and make friends. There are 4 classes per day, during the morning or afternoon, lasting from one week. If you want to have an extra lesson everyday focusing only on speaking, this is the course for you. There are 5 lessons per day. This Spanish course is a combination of Intensive 20 and individual classes. There are 5 classes per day, 4 in a group and 1 individual. The individual classes can be adapted to the needs of each student, so that they can use them to study areas in which they are most interested. This course is designed for students who wish to develop their communication and linguistic skills in a very intensive course. It is a combination of the Intensive 25 course and private lessons. There are 6 lessons per day, 5 in a group and 1 private. The private lessons are intended to deal with the specific needs of each student. 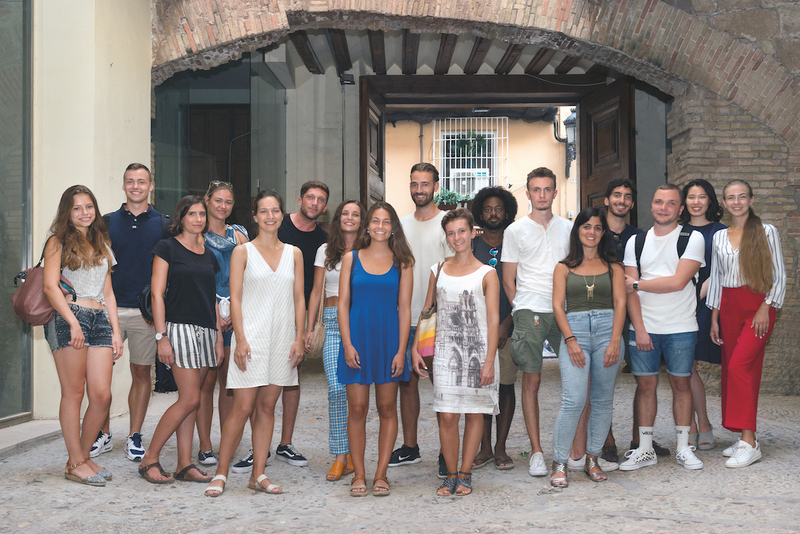 This programme is designed for students who wish to study for at least 12 weeks, and who also wish to experience Spanish lifestyle and culture. There are 4 lessons a day, in the morning or in the afternoon. Nº of students per class: Maximum 10, average 6. Renowned as an international centre for sailing, Valencia was also home to the 32nd America’s Cup. Our Spanish and Sailing course is aimed at all levels, from the absolute beginner to the experienced sailor. You will receive expert tuition, navigate and race in our boat “Españole” which is a Beneteau Platu 25 based in Valencia Yacht Base. During the course you will be given a solid grounding in boat handling, meteorology, seamanship, safety at sea, nautical terms, rope work, sail handling, rules of the road, helmsman ship and general duties above and below deck. This course must be combined with any General Intensive Spanish. Our teen programme is designed for youngsters aged between 14 and 17 with all levels of Spanish. We expertly combine our lessons in small, caring classes with cultural and leisure activities. It runs during the summer. Host family accommodation in double room with full board. Activities, cultural visits and sports every afternoon from Monday to Friday. We put a lot of effort into opening the minds of our teenagers through total cultural immersion. Students walk away with new skills, greater appreciation for other cultures, new friends from across the world and more insights into what they can achieve. The German Bildungsurlaub is an accredited programme in which German employees can take 5 days of educational leave (paid vacation) per year, or 10 days in 2 years, that are recognized as a professional advanced training. During the 'Bildungsurlaub' the normal salary is kept. The Bildungsurlaub programme is especially recommended for language courses. Taking a Spanish course is a good option for Bildungsurlaub. It gives you the opportunity to travel and improve your Spanish language skills at the same time. The Bildungsurlaub Spanish course consists of 25 hours lessons per week plus 5 additional cultural, social, political lessons, making a total of 30 hours per week. This course is specially designed to prepare students for the internationally-recognised DELE exams organised by the Cervantes Institute. These are official certificates accrediting the student’s command of the Spanish language. There are five exam sessions per year: April, May, July, October and November. DELE examinations are offered at six different levels which meet the Common European Framework of Reference (CEFR). Diploma de español Level A1. Diploma de español Level A2. Diploma de español Level B1. Diploma de español Level B2. Diploma de español Level C1. Diploma de español Level C2. Nº of lessons per week: 20 general Spanish lessons + 10 exam preparation lessons. Length of lesson: 50 minutes. Levels: Beginner (A1) to superior (C2). Nº of students per class: Maximum 10, average 4. This course is designed for foreign students who wish to complete a university degree in Spain. To achieve this, they must first pass an entry exam known as “PAU” (Prueba de Acceso a la Universidad) or “Selectividad”. The preparation courses for PAU are tailored to each individual student; it is a fast and easy way to gain access and it doesn’t matter what your level or capabilities are. Intended for students from foreign educational systems with which Spain has homologation agreements making their qualifications compatible, who have completed upper secondary school up to the Spanish Bachillerato level (pre-university course) in their countries. Nº of lessons per week: 20 weekly classes: 15 exam preparation clases + 3 English clases + 2 Spanish classes. Level of Spanish: You need to have a minimum level of B1 in Spanish (as requested by the Common European Framework of Reference for languages). If you like you can do an intensive Spanish course with us before the PAU preparation course starts. This course is designed for students and professionals who are interested in the world of business in Spanish-speaking countries. Students study specific language and linguistic structures used in business. Nº of lessons per week: 20 general + 5 business. Length of the course: From 1 to 6 weeks. Levels: Intermediate (B1) to superior. Nº of students per class: General: maximum of 10, average 6; Business: Mini group maximum of 4. Timetable: Mornings 9:30-14:30 or afternoons 13:30-18:30 (subject to change). Starting dates for beginners and non-beginners: Every Monday. We offer Spanish courses for school groups throughout the academic year and during the school holidays that are custom-made to respond to their individual needs and requirements. Our group courses are designed for school teachers who want to arrange trips for their students to complement their classes at school. We aim to provide effective language learning and an enjoyable and rich cultural experience in Spain within a limited timescale. The core programme consists of language classes which are accompanied by a wide variety of fun and educational activities and excursions. These are customised to suit different interests, ages and programme lengths. We also arrange accommodation. We cater for groups of any size from 10 students upwards. Typically we would expect to receive groups of between 10 to 30 students for a trip of 1 or 2 weeks. 15 or 20 hours Spanish language tuition in the morning from Monday to Friday. Afternoon activities and full day trips on the weekends. Host family, or residential accommodation with breakfast and evening meal or full board 7 days per week. Transport to and from airport. Welcome pack, placement test &amp;amp;amp;amp;amp;amp;amp;amp; course certificate. 1 leader with free accommodation per 10 students. Our family language programmes are specifically designed to fit the lifestyle and requirements of each individual family. They are flexible and fun, and can be tailor-made to create the perfect holiday experience. Children join our exciting junior or teenager summer courses, while parents share their international learning experience with other adults from around the world. It’s a perfect combination of language lessons, tours, activities and excursions. After the Spanish lessons our students have the opportunity to visit some of our nearby historical sites, enjoy a number of Valencia’s famous cultural events or simply relax on our beautiful beaches. Parents can either meet up with the children after class or have some precious time to themselves. ur Spanish lessons focus on communication: students learn and practice the language in communicative contexts, reproducing everyday life situations. The courses are programmed depending on the language level and age. Intensive language course: Intensive 20, Intensive 25, Spanish for business. Groups of 10 adults students maximum. Activities in the afternoon or free time. Groups of 10 students maximum International classes. Supervised activities every afternoon from Monday to Friday. Junior centre located 15 km outside Valencia. Groups of 12 students maximum. Spanish students in the school learning English. Leisure and sport activities every afternoon from Monday to Friday: flamenco dancing, Spanish cookery, chess, karate, theatre, volleyball, swimming and much more. This course is aimed for non-native teachers of Spanish who want to combine a stay in Spain with a well-structured refresher course for teachers. It combines aspects of the Spanish language and culture with methodology and practice. The participants in our teacher training courses will have access to practical, efficient training to teach Spanish to foreign students. Our trainers have many years of teaching experience and are real experts in teaching of second languages and in the creation of specialized materials. - Revisión of grammar topics (verb tenses, ser y estar, por y para, subjuntivo). How to teach them to your students. - Common mistakes foreign students make in Spanish and how to solve them. We have recently relocated to Spain quite last minute so sent my son and daughter her to learn Spanish. Both were apprehensive about going as they didn’t know much Spanish at all and everything was all so new to them. Firstly, the teachers were second to none. They made my children feel at ease straight away and were genuinely passionate about their learning progress. The booking process was a breeze and any issues or questions were dealt with and responded to right away! I’ve even just booked myself onto an intensive course. Really loved this place. Really helpful crowd and felt that I learnt a lot. The area is a real bonus too. Lots going on and met some great people. Would come back in a flash. Beautiful city, amazing people, perfect school!